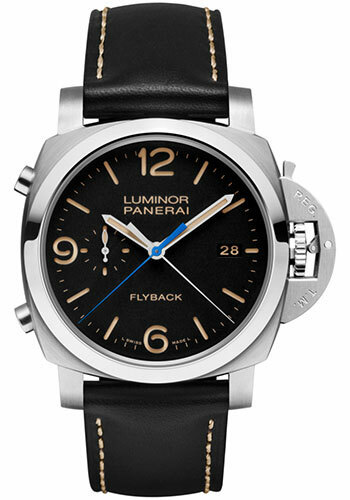 44 mm brushed steel case, 8.15 mm thick, sapphire back, brushed steel crown, polished steel bezel, sapphire crystal formed of corundum, black dial with luminous arabic numerals and hour markers, date at 3 o’clock, seconds at 9 o’clock, central chronograph seconds and minutes hands, calibre p.9100 automatic movement with hours, minutes, small seconds, date, chronograph flyback, seconds reset, approximately 3 days of power reserve, black calf rugby strap. Water resistant to 10 bar. 44 mm 18K polished red gold case, 8.15 mm thick, sapphire back, 18K brushed red gold crown, polished red gold bezel, sapphire crystal formed of corundum, black dial with luminous arabic numerals and hour markers, date at 3 o’clock, seconds at 9 o’clock, central chronograph seconds and minutes hands,, calibre p.9100 automatic movement with hours, minutes, small seconds, date, chronograph flyback, seconds reset, approximately 3 days of power reserve, dark brown alligator strap with ecru stitching. Water resistant to 5 bar. 44 mm matt black ceramic case, 8.15 mm thick, sapphire back, black ceramic crown, matt black ceramic bezel, black dial with luminous arabic numerals and hour markers, date at 3 o’clock, seconds at 9 o’clock, central chronograph seconds and minutes hands, calibre p.9100 manual winding movement with hours, minutes, small seconds, date, chronograph flyback, seconds reset, approximately 3 days of power reserve, dark brown calf assolutamente strap. Water resistant to 10 bar.